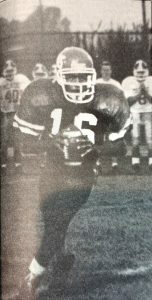 Football – only player in LCHS Football history to have over 2000 passing yards and 1000 yards rushing. Basketball – Holds the single-game record with 14 assists in one game. One of the very few four-sport athletes who could and would change the outcome of the game with his skills and his leadership abilities. K.C. was a complete student-athlete, and was well respected by all of his teammates, coaches, and opponents. K.C. had a certain swagger that was magnetic and contagious. His natural leadership ability has led him to be a successful coach in the college and high school ranks. From Rodney Armes – Watching his work ethic and leadership skills is what really stood out to me. Not only was he a great athlete but he was a tremendous competitor. He competed every day in practice and made his teammates better. KC had the ability to take over any game at any time. From Jim Boley – K.C., or “K”, was a natural leader from the time he began playing sports, whether it be basketball, football, or baseball. He led more by example than by being vocal. He was the leadoff hitter in baseball who “set the table” for the offense. He was the PG in basketball who could be counted on run the offense as well as make the clutch basket in a close game. He was the QB in football who would use his great speed and quickness to create multiple problems for the defense. K.C. exuded a quiet confidence which helped make his teammates that much better. From Scott Kirkpatrick – K.C. was an incredible athlete who managed to use that athleticism, along with great effort, to provide his teammates with an opportunity to be successful in whatever sport he was participating in. Two of my favorite memories of K.C. was his 103 yard interception return against Edmonson County and his ability to destroy the defense when running our formation called “Hawk Special.” K.C. is very deserving of his induction to the LCHS Athletic Hall of Fame. From Phil Eason – I did not coach K.C. but I can state unequivocally that there has not been a better natural leader than K.C. He has that natural talent to influence others. Whether it is in athletics or in the hallways he always made those around him better. People willingly followed K.C. given the person he is. As an athlete I never saw him fold under pressure. In fact he wanted to be the person that made the big play during the biggest part of the game. He displayed confidence in himself which rubbed off on his team mates. I loved having K.C in school….he always brought sunshine with him every day.